I have a bottle of bourbon whiskey around, and drinking it straight was kind of torturous. What I like to do with alcohol that’s hard to swallow in its natural state is mix it with lots of sugar. And butter. And these fudge brownies have a lot of sugar and butter. 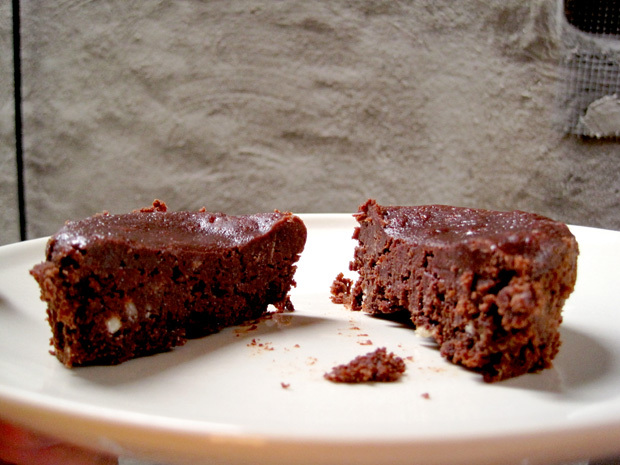 It really is a dense and fudge-y brownie, and the downside to that is that you can’t really get drunk on these brownies because they’re so rich and decadent. Or is that an upside? Regardless, the alcohol flavor is pretty subtle, so no one’s getting drunk on these. Based on all the recipes I’ve seen, it seems like bourbon is a popular match with bacon, pecan, apples, chocolate, and butterscotch. All good stuff. Regarding the recipe, I cut it down to a third and added a little bit more bourbon into the brownie, because the original recipe said the alcohol taste was subtle and if I’m going to put hard liquor in my dessert I better be feeling it. Having a digital kitchen scale is really, really useful for scaling down recipes. I highly recommend getting one. Kitchen scales are inexpensive and they help make your baking so much better. This Escali Primo one is the one I have, and it’s less than $20. I also baked my brownies in ramekins, and as a result, had to pull it out of the oven when it was a tad underbaked so it could continue cooking through while in the ramekin. Preheat oven to 350 degrees F. Line 2 3.5 inch ramekins with parchment paper, or use 3 muffin tins. Melt butter in a saucepan set over medium heat. When butter starts to melt and coats pan bottom, add chocolate and reduce heat to low. Stir constantly until chocolate is melted. Add the granulated sugar to melted chocolate and stir over low heat for about a minute or two. Remove from heat and let cool for about 5 minutes. Beat eggs with an electric mixer for 3 minutes or until very light. Add brown sugar to eggs and continue beating for another two minutes. With mixer going, add melted chocolate mixture to egg mixture. Scrape sides of bowl and beat in vanilla, 1 tablespoon bourbon and salt. Add the flour and stir just until mixed. Pour into pan the pan and bake for 20 minutes or set. Let cool for about 20 minutes on a wire rack, then brush tops with remaining 1 tablespoon bourbon. 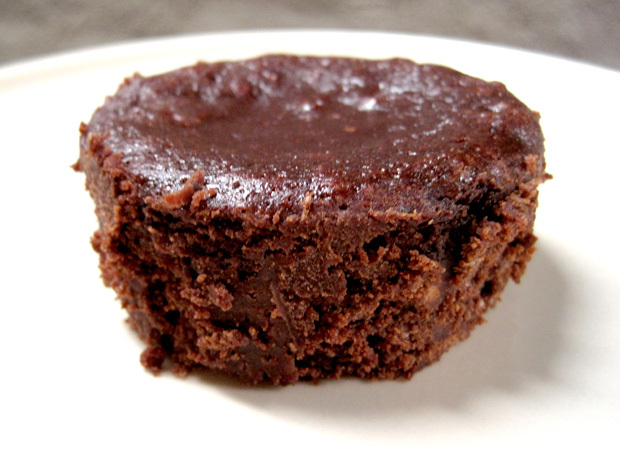 Let the brownies cool to room temperature, then transfer to the refrigerator to chill for a few hours or overnight. The chilling/sitting time is important. The texture changes as the brownies chill. This also gives the bourbon flavor some time to develop, though it is quite mild.